Okay. Try and stop giggling. A Haboob is a real thing. I know. One just showed up on our doorstep. And this Haboob has nothing to do with my Dairy-Free Coconut Caramel Banana Ice Cream topping. But I just had to share this with you today just in case you were in the mood for ice cream. I have now come to the conclusion that no ice cream should be eaten without this topping. And I wanted to catch you before you dished yourself up a bowl. A Haboob is a wall of dust as a result of a microburst or downburst. The air forced downward is pushed forward by the front of a thunderstorm cell, dragging dust and debris with it, as it travels across the terrain. This is the one that so generously greeted us upon our return home to Scottsdale, Arizona, after spending two weeks in San Diego. It measured 50 miles wide and 5,000+ feet tall and it engulfed our entire city. It made me totally wonder why we ever came back from the beautiful skies and the blue waters of the Pacific Ocean. I almost told my husband to put the kids back into the car and head West again. We had literally been home no more than fifteen minutes when we looked outside and could not even see our pool, or our neighbor’s house, or the street, or our trees, or our dog (who came running in as if a lion was chasing him)…. It was totally bizarre and I can honestly say I have never seen anything like it. When we walked outside the next morning, there was a layer of dust at least a quarter inch thick covering anything and everything that was outside during that storm. So…while a majority of the country spends a large part of winter digging out from mounds of snow, we Phoenicians get to spend our summers trying to hose ourselves off and out of the depths of dust. Now, aren’t you jealous of us? I imagine you are packing your bags for your move to the Southwest right about now. But aside from Mother Earth’s Welcome Home Party that she threw for us, we had a wonderful time at the beach. We enjoyed: family, friends, fireworks, fun, deep sea fishing, Farmer’s Markets, fabulous feasts, snow-cone selling, sand sculpting, boogie boarding, birthday celebrations (my baby turned 4), a lost tooth (my 6 year old lost his first one), and lots and lots of relaxation (I actually started and finished two entire books). It was marvelous. 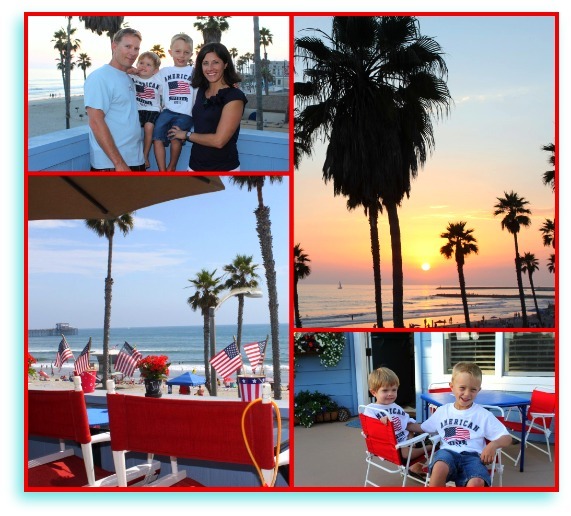 And we had a perfect Fourth of July…. 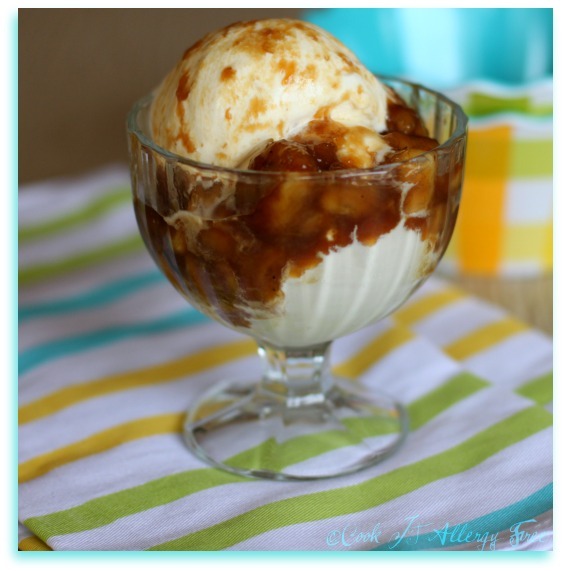 Now that we are home and back to the land of the hot, hot, hot, I decided to whip up this Coconut Caramel Banana Ice Cream topping this afternoon after we spent the day out in the sun, swimming and playing. This ice-cream topping is the easiest and most delightful one that I have made. Oh. And it only has three (yes, 3) ingredients (unless you want to be technical and count the pinch of salt as a fourth). One more thing. It only takes seven (yes, 7) minutes to prepare. That leaves you plenty of time to get back to your warm-weathered fun and lazy summer evenings! And now I will repeat what I said before. Ice cream should not be eaten without this topping. Disclaimer: This opinion is solely my own. You must make your own decision regarding this. I will not force this opinion on to you. 1. Heat Coconut Oil in a large skillet over medium-high heat for 2 minutes. Add Bananas and stir to coat with oil. 2. Add Coconut Sugar and Sea Salt. Cook for 5 minutes, stirring continually until sauce begins to thicken and reduce and Bananas are coated. 3. Serve warm over Dairy-Free Vanilla Ice Cream, such as So Delicious Frozen Dessert (or Dairy Full version of choice). Cara’s Cravings and the Tropical Traditions Giveaway she is doing right now! Looks like you’ve had some good times lately! This has been a great summer so far! The caramelized bananas look amazing! We do something similar, but I’ve never used coconut oil. I will definitely try that next time! It’s like you’re begging me to come live with you. I can see right through it, Kim. YOU’RE A THIN VEIL. Oh, how I love all those photos of you guys! They’re fantastic. And if my current ice cream availability was not watermelon sherbet that I made this morning, I’d be all over this new #1 topping! I’m sitting here thinking about making an almond milkshake with it. Seriously. LOVE that top photo! I knew about your dust storms, but I didn’t know they were called haboob’s. So glad that didn’t happen when we were visiting in the Monster Truck! Are the pool filtration systems set up to handle that much dust? I heard the dust comes in through all the cracks and crevices. With that kind of power, it would have to! Shirley, an almond milkshake with this would be unbelievable!! Seriously! And I can only imagine if you had been driving in The Beast when that dust storm hit. There were all kinds of accidents and everyone seriously had to stop driving. And the dust was seriously EVERYWHERE!! In everything. On everything. It wrecked pools. I should post some pics of my in-laws pool. It looked like a muddy swamp (normally it is pristine and perfect). Ours somehow was not near as bad as some of our friends and fam though. The pool stores ran out of everything and had lines out the door since most people have pools here. One of the news teams did a aerial shot of backyard pools the next day and it was insane what they all looked like. Your photos are always great and I like the bright colours of the dishes. You look so beautiful, Kim, and so does your family! 🙂 Glad to hear you all had a great 4th of July. This looks AMAZING!!! I simply must try it!!! I cannot believe your furniture was in the bottom of the pool and hot tub! I still am finding dust in strange places! So crazy! 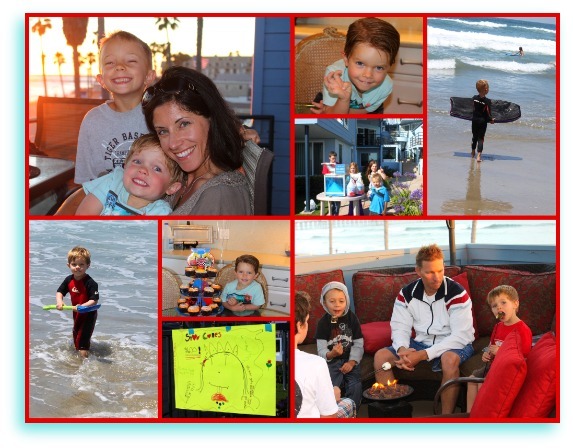 Love the collage of the family pictures. Sure missed not being there this year. That Haboob will be something to talk about for years to come. The ice cream yummie looks delicious. The only problem is that I just exercised so eating it would negate my workout. Thanks Mom! Guess what Carson said again tonight, by the way, just as he was supposed to be going to sleep. LOL I told him he could call you in the morning before you leave for all of the appointments. Holy wall of dust Batman! WOW! I lived in Arizona for a couple of Haboob, just lucky I guess. The ice cream sauce sounds perfect and I love the family pix. Glad you hade a great time! Carol, that is exactly what it was, a Holy wall of dust! It was disgusting. Thank goodness it finally rained/poured the other night for like 6 hours and washed it off of everything. It was exactly what we needed. We get huge walls of red top soil blown as dust storms too. They’re pretty eerie aren’t they? Looks like you had a great time, but over here we are still recovering from cyclones decimating our bananna crops and they’re about $15kg! So I will just take your word – and psychic and intuitive abilities, and belive you. Yuummm…. InTolerantChef, those dust storms are so definitely eerie. How sad that your banana crops got hit so hard! ;( I cannot believe how pricey they are now! Hopefully they recover soon! That is crazy!!! Ah, the hazards of desert dwelling. Crazy or not, I’m at the ocean and totally miss the desert, but wow that is one insane weather occurence. And who decided to name it a haboob? Someone was smoking rope when they came up with that one! I’ve been using coconut sugar to make caramel sauces lately and tried to add banana to make ice cream. Note to self – add lemon or bananas turn an ugly gross grey while attempting to freeze. Your sauce looks like a better idea! Alisa, did you really just say that you are at the ocean and MISS the desert, crazy lady?? LOL It is okay. I get it though. Even when I am at the beach, I miss my home. There is just something about the beauty of our desert here. And I so totally agree on the name of the Haboob! It just sounds so strange! My kids crack up every time they hear them talk about it on the news or something. I’m with AndreAnna, it’s like you’re begging me to come live with you…at your oceanfront place that is. I have enough wind and dust (and wild fire smoke) to contend with in New Mexico, LOL! Heidi, I have been begging you for the last year to come live with me. LOL Of course, we could just go hide out together at the beach and escape from it all!! Especially since you are totally right..It would not be much of a change for you to come from NM to AZ!! 😉 Hope you enjoy the sauce (the bananas that is. Not the other kind. Unless you are pouring one for me too). I have never heard or seen a haboob before – how interesting – we just get a ton of snow here in the Northeast. 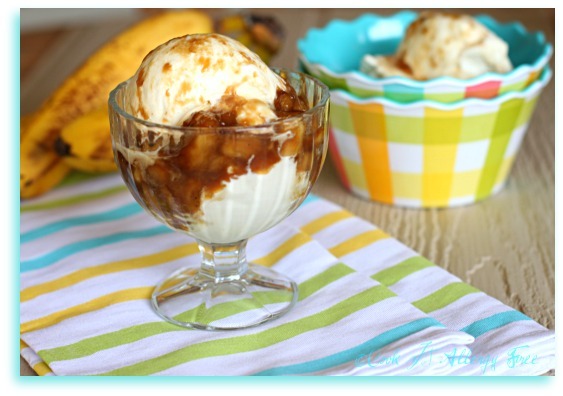 Love all your family pictures and I can’t wait to try this coconut caramel banana topping – I know my kids will love this! I never knew it was called a haboob! It’s a spectacular sight from a distance, but it sounds like a harrowing adventure to actually experience firsthand! Your ice cream sauce sounds insanely decadent, and I can’t wait to try it with my favorite So Delicious coconut milk ice cream! And what a brilliant idea! This would be unbelievable on cake! I am SOO going to do that! Your description of a haboob is pretty, um, wild! Can’t say I’ve ever heard of such a thing 😉 But coconut oil and bananas and caramel and ice cream? Yup, I can totally relate to that! Sounds so wonderful – thank you for sharing it in my link up!